This 1978 album finds producer/Svengali Frank Farian starting to push his pop-disco attraction BONEY M. into new and interesting musical territory. The songs are still very much disco tracks with an emphasis on bubblegum pop hooks, but Farian works some interesting musical flavors into the mix: "Painter Man" (a cover of a track by mod rockers Creation) effectively pits a series of heavy, distorted hard rock guitar riffs against its danceable beat, and "Brown Girl in the Ring" adds some distinctive steel drums into its rhythmic calypso-pop mixture. However, the oddest and most unusual and interesting combination of musical elements arrives with "Rasputin," a tribute to the legendary Russian historical figure that uses balalaikas to create its textured rhythm guitar hook. Nightflight to Venus also spawned a major international hit with "Rivers of Babylon," which mixes religious lyrics and a folk song melody with a pronounced beat to create an instantly accessible pop hymn. The other tracks include a few less than colorful moments ("Never Change Lovers in the Middle of the Night" could have been performed by any disco outfit), but Nightflight to Venus is an overall success thanks to the group's strong harmonies and the slick production from Farian, which keeps everything moving at a fast clip. The end result is one of the strongest albums in the Boney M. catalog, and a treat for anyone who likes dance music that is sugary sweet. — Donald A. Guarisco. 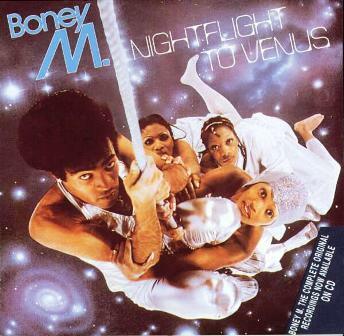 Ladies and Gentlemen, welcome aboard the starship Boney M for our first passenger flight to Venus. take-off on this first Nightflight to Venus. at a speed of 2183 miles per second. Captain - unidentified object at 8 o'clock - 2 million miles away. Stand by for emergency manoeuvre. Object coming closer at the speed of light. We have 8 more seconds. Change course by 4 point 6 degrees. the safety mechanism will do the rest for you. He was a Steppenwolf, He cried "It isn't fair"
He was a Steppenwolf, "You know how much I care"
He was a Steppenwolf, She said "This is the deal"
Don't pay no union dues. Been a miner for a heart of gold.